Postern gate! ‘A what?’ I hear you cry…Traditionally, a postern gate was a gate built into a wall and found in places like castles and forts; usually in a concealed location, for making clandestine exits in haste…however, these days it has come to cover gates into secret gardens or walled gardens! 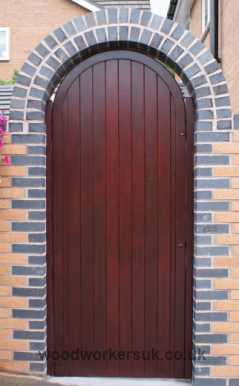 If you look at practically any of our timber gates range within our website, you’ll notice they have joggles (horn-like protrusions) on the top corner or each gate; the exception to this is our range of Arched gates, Semi-circular arched, Tudor arched and Gothic arched gates – the way these are made are totally different, hence no joggles! If you’re looking for a gate that leads into a secret or walled garden where the wall will totally enclose the gate above and down each side of the gate, then you’ll need a postern gate without the joggles. 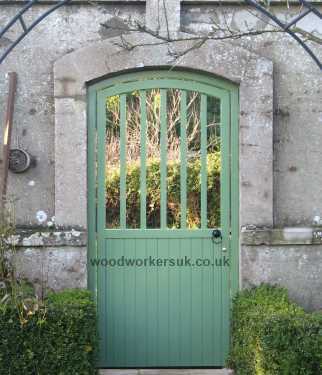 Quite a common question we get is something along the lines of ‘Can I fit these gate into an enclosed opening, and if so can I cut the pointy bits on the top, off?’. In short, yes…no and not really, in that order. The top of one of our Denbigh pedestrian gates, showing a joggle. Joggles, no joggles – what’s the difference? 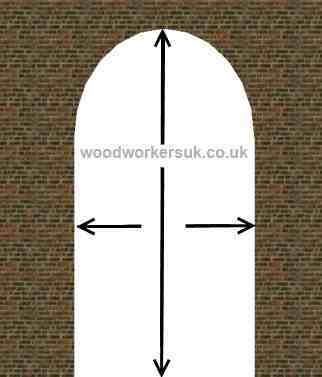 Postern gates – A frame or gate posts? I’ve an opening with a shaped top – can you make me a Postern gate? 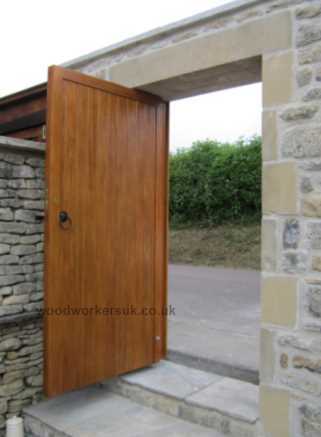 Usually, Postern gates will be single pedestrian gates, however, there is nothing stopping you from hanging a pair of gates within an enclosed opening; give us a call if you need advice on this. 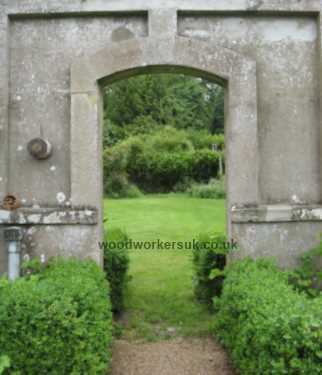 Entrance to a walled garden – gate less! Entrance to a walled garden with gate in place! The gate pictured in the before and after images above was a bespoke gate made to our customers own design! The joggles that stick up are there to give the through-wedged mortice and tenon joint on the top rail/head of the gates strength, so to cut the joggles off will weaken the gate; if you do want to fit a gate within an enclosed opening, then we can make the gates differently for you to solve the issue of joggles being there in the first place: please don’t cut the joggles off! Let us know how you intend to fit the gates so we can make them to suit and make them to last. Joggles, no joggles – whats the difference? The gates are made practically the same whether you opt for joggles or not, the difference is solely the joint used at the top of the gates; on a gate with joggles, we use a through-wedged morticed and tenon joint; on a gate without joggles, we use a through-wedged, haunched mortice and tenon joint (see below for the differences). If you were just to cut the joggles off the top of your gates, then in you are weakening the joint. 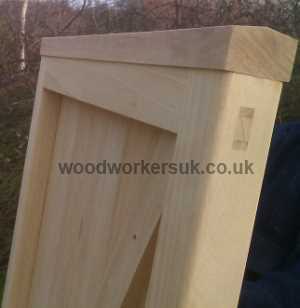 Shown left, is what is likely to happen, as the gates are based on a through-wedged mortice and tenon jointed frame; cutting the joggles off leaves no timber over the top of the joint to hold the joint together. Below, is the proper joint for a Postern gate, it’s a through-haunched morticed and tenon joint and used in door construction. We actually use this joint as well in our garage doors!. 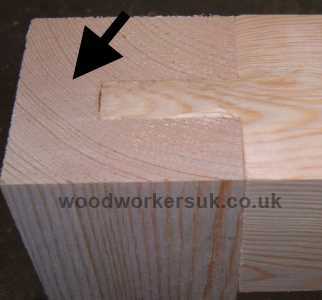 A haunched tenon joint, the secret is the piece of tenon which isn’t there! 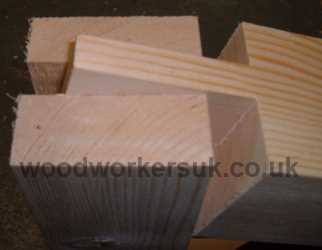 The mortice is cut in such a way so the tenon ‘keys’ into it, locking it into place. Postern gates with a frame or gate posts? You can fit the postern gates either way, the choice is yours. If you go for a shaped gate, like a semi circular arched gate, then a frame will be more expensive than either gate posts or the more common rectangular frame for a flat topped gate, as we’ve got the additional work in shaping the frame. Another thing to bear in mind when deciding what to go for is you still need clearance gaps down each side of the gate, as well as above and below the gate, so don’t expect a nice tightly fitting gate. Unlike front doors and interior doors of around 45mm thick, where you have a gap all the way around the door of 2mm (or so), with an external gate that is 70mm thick, you need larger clearances to enable it to operate and also for the clear passage of air to flow to remove any water before it builds up, which in turn can ultimately lead to rot. Then you’re just after a flat-topped gate not a postern gate! If you’re looking for a gate without the protruding joggles, and it is not sitting in an enclosed opening, i.e. with no wall directly above it, then we can make these for you. Ideally, however, the gate should have a capping on the top so the end-grain isn’t exposed to the sky; the end-grain is where the joggles would be, if they were present. 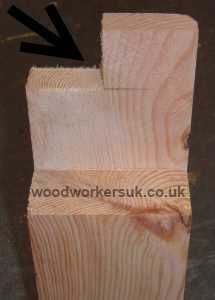 Being shaped, they act as a water run-off, as well as giving the gate strength, so no water sits on the end-grain for any length of time; end-grain is notorious for soaking up water/paint/stain etc, as this is how the tree, for want of a better word, drinks, so it is good practice to either add a capping to the top of the gates or keep the joggles present in the first place. If the gate has no joggles and is not being fitted as a postern gate, then it needs a capping on the top for protection from the weather. You don’t usually include the capping on a postern gate, as the top of the gate is protected from the worst of the weather by the brickwork and, if present, the gate frame above! I’ve an opening with a shaped top, can you make me a gate to suit? Yes, if it’s a flat gate, for example, like the Denbigh, pictured above as a postern gate, then it’s simply a case of giving us the height overall from floor to the underside of wall height of the opening, as well as the overall width between the two walls. If you’ve got a curved or arched opening, then we can make something to suit your opening, but to make sure it’s an exact match, we need a bit more information rather than just the sizes. 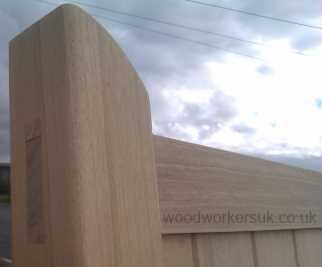 To make you a wooden gate to suit a shaped opening, we need a template/pattern supplying that has the shape of the arch marked upon it; this way we can be sure that what we make is a perfect fit for you. 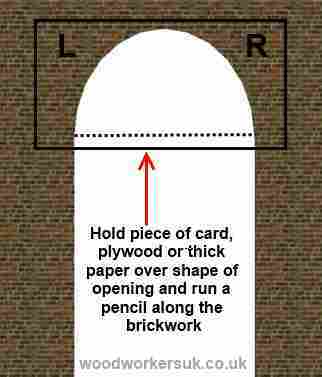 Firstly, we need the overall height from the floor to the underside of your brickwork or lintel at the highest point of the arch, or whatever shape your opening is. Then, we also need the opening width brick to brick; you’re best doing this in three places: at the top, the middle and the bottom. Next, we need the height from the floor at which the arch (or curve etc) starts to form; do this on both sides of the opening. It’s also best to make a note which side of the opening is which measurement! Finally, we need you to draw the actual shape of the opening onto either card, thick paper, or plywood. To do this, hold your card etc. up over the shape of the arch, making sure the template is big enough to come below where the arch starts to form. 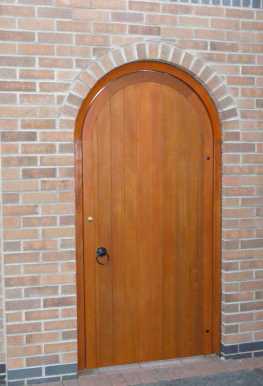 Then simply, from inside your opening, draw around the shape the brickwork or stonework gives you! Also, mark onto the card etc. the left hand and right hand side of your opening from the side you mark the template on. Last of all, we then need to know whether the line you have marked is the front or back of the opening. 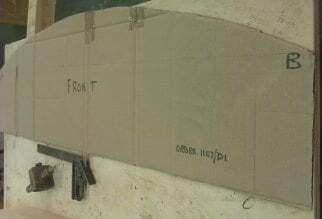 If sending us a template of the opening then please do not cut the shape of the arch, we will do this. Example of a template/pattern for a postern gate. This was for the postern gate we made in the before and after picture above. Opening for your postern gate not yet built? To tell us the size of the gate you require and the style, i.e. 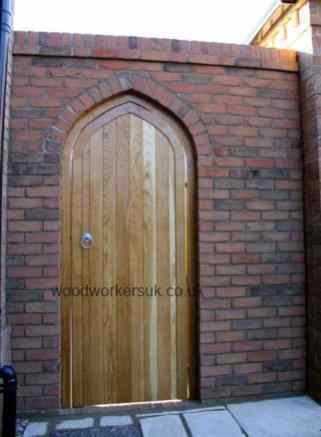 Tudor arched or send us a drawing for something bespoke, and we can make the gate, with frame or posts depending on what you require, and when it is made, you then build the opening to suit the gate. Build your opening and send us a template/pattern once it has been built. Automating my gates, can I do without the joggles? No, I don’t doubt others will do this for you, but knowing timber and also the added stresses that automation systems put on wooden gates then I wouldn’t recommend (or manufacture) wooden gates to suit automation without the protruding joggles. We’ll happily make you the gates to suit automation or make you the gates without the joggles but not both.